Tobias Thierer took this photograph of a house on Baldwin Street in Dunedin, New Zealand. 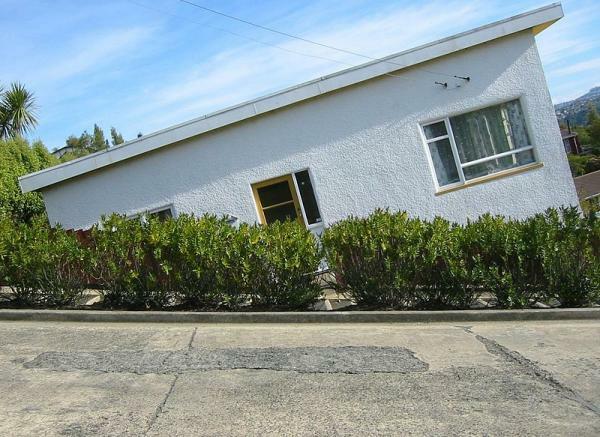 You might be forgiven for thinking that the people who live there would have difficulties getting in and out of their front door without falling over, but is it the house that's slanted, the hill it rests on or the cameraman ? The house is on a hill but the bushes cover the enter to the house , I can see the brown fence on the back of the bushes .,, which mean that the house is ok In CA looks many like this. Is a two story home, but you only can see from the road the second floor., this house is on a hill, I went to google and is perfectly fine.